The reputation built by your Galveston based business, construction site or special event depends, in part, on the environment and experience that it provides to staff and guests. That’s why making sure sanitary facilities like porta potties, hand wash stations and restroom trailers are clean and available is so important. At Texas Waste Co., our reputation depends on the services we provide to help safeguard yours. All of our porta toilets and other portable party rentals are privately owned and maintained in-house to ensure that your business, construction site or special event venue receives the highest quality porta potty rental facilities. That’s why porta potty brokers with clients on the Galveston Island turn to Texas Waste Co. to deliver on their customer promises. Since 1999, we’ve been a name that the community and the industry has grown to trust. Our prices are also simply structured and we manage a large supply of porta potties and party rentals to accommodate for same day delivery or scheduling in advance. Contact Texas Waste Co. the next time you’re in need of a sanitary facility rental in or near Galveston. We are deeply committed to serving the communities in which we belong to. From employing local residents to supporting other local businesses, our services are rooted in Galveston and dedicated to upholding its high caliber reputation. The famous pirate, Louis-Michel Aury founded Galveston in 1816 in support of the ailing Republic of Mexico as they fought for independence from Spain. The Port of Galveston was established in 1825 by the Congress of Mexico and ironically served as the main port for the Texas Navy during the Texas Revolution. Galveston is most known for the Galveston hurricane, which struck in the 1900s and desecrated the city. It’s still known as one of the most deadly storms in American history. In the 1920’s and 1930’s the city reemerged and became a sought after tourist destination under the influence of the Maceo family and their exploitation of liquor and gambling during prohibition. In 1942, William Lewis Moody, Jr. established the Moody Foundation to benefit current and future generations of Texans. The foundation would play a prominent role in Galveston for more than half a century thereafter, transforming the island with numerous civic and health oriented programs. If your looking for the best service and price for porta pots in Galveston, TX we have them. 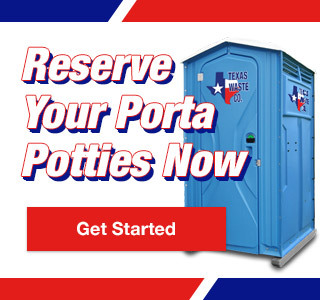 Galveston – Porta Potty Rentals Available Now!